Will Low was one of Lawrence Park’s earliest residents (he arrived in 1897) and was certainly the most ardent spokesperson on behalf of his colleagues. Will studied many art forms, but excelled as a muralist. 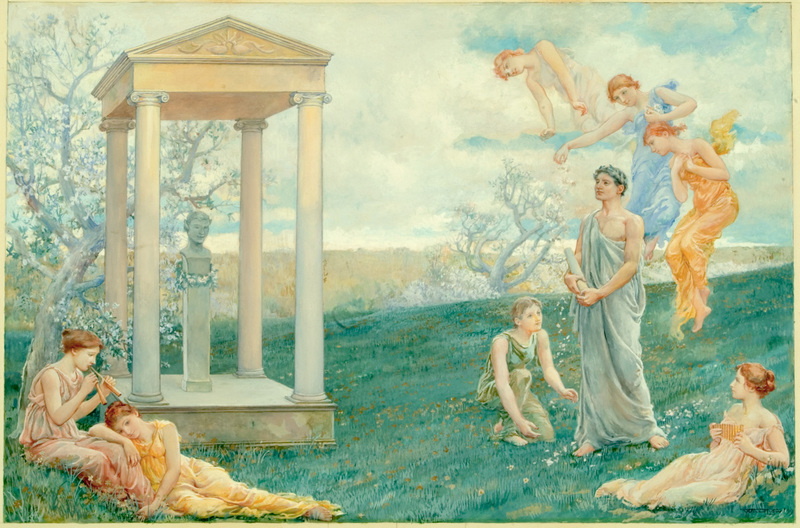 Notable among his many accomplishments were the thirty-six twelve-foot high panels for the rotunda of the New York State Education Building in Albany, which he painted in his Bronxville studio between 1913 and 1918. He finished his last painting, a mural donated to the Bronxville School, only a few hours before his death. Illustration for Ballade of Horace’s Loves demonstrates Low’s penchant for classically inspired allegorical subjects, nudes and toga-clad models. In this watercolor, the head of Pan looks out from his perch in a little Greek temple. The male figure at the right is the Roman lyric poet Horace holding a scroll and wearing a laurel wreath. He is surrounded by angels and nymphs, one of whom holds a Pan pipe, or Syrinx. The watercolor became an illustration for a poem by George Meason Whicher that was published in Scribner’s Magazine in January 1902.